Citation: Yachaj. "Mushroom Cultivation: From Falconer to Fanaticus and Beyond". The Entheogen Review. Winter 2001;10(4):127-139. The first successful cultivation of psilocybian mushrooms from México was accomplished by the French mycologists Roger Heim and Roger Cailleux in Paris during the late 1950s. The first kitchen cultivation methods for basement shamans came to light in the 1970s. But the real breakthroughs only recently became accessible to the public. The roots of psilocybian cultivation techniques go back to 18th century France, when Agaricus (white button) mushrooms were first cultivated; King Louis XIV (1643-1715) may have been among the original European mushroom growers. The mushroom "sewing seed" (or spawn) was obtained by digging up mycelium from meadows where wild agarics grew and horses were active. The mycelium was then transferred to special caves near Paris, set aside for this unique form of agriculture. From France, the gardeners of England found mushrooms an easy crop to grow, requiring little labor, investment, and space. English mushroom cultivation increased in popularity, due to more experimentation with spawn and publicity in journals and magazines. In the late 19th century, mushroom production made its way across the Atlantic to the United States, where curious home gardeners in the east tried their luck at growing this unique crop. Then, in 1891, the first book on mushroom growing was published, and it shed new light on the theory of cultivation on horse manure compost. William Falconer, a mushroom grower and experimenter from Long Island, agreed with the recommendations of agricultural journalists and compiled their theories into Mushrooms: How to Grow Them; A Practical Treatise on Mushroom Culture for Profit and Pleasure (available on-line at Archive.org). The early methods of finding, digging up, and perpetuating the wild mycelium were uncertain and unreliable. The first manufactured spawn combined a mixture of horse and cow manure pressed into bricks--the original source being the wild mycelium. The bricks were not sterilized, however, and could harbor pathogens and weed fungi. Interestingly, the psilocybian Panaeolus subbalteatus used to be a common weed mushroom when these classic methods were applied. On a few occasions people ate mixed batches of Agaricus and P. subbalteatus, and experienced the first (involuntary) "trips" in Western history (Gartz 1993). Hence, Falconer's book is still among the most informative publications for home cultivators of potent psilocybian mushrooms like Panaeolus cyanescens and P. tropicalis. He describes mushroom cultivation in cellars and greenhouses on horse manure compost in better detail than any recent author. Introduced as "Mr. Gardener's method," Falconer even devotes a full chapter on the yield-boosting effects of a casing--a top layer of soil placed on the mushroom bed, made from loam (a mixture of clay, sand, silt and organic matter). This important discovery was soon forgotten and only eighty years later rediscovered. Spawn of P. mexicana was grown in flasks under sterile conditions on composted straw that had been well washed. Unwashed straw compost was placed in earthenware pots and sterilized. The pots of compost were then inoculated with spawn from the flasks and set in a greenhouse. After about two weeks the compost was well invaded by the mycelia and covered with a thin layer of casing material. The casing material consisted of an unspecified mixture of various sands and calcareous (chalky) earths. The greenhouse temperature oscillated between about 19 to 25 centigrade. In three to six weeks after casing, mushrooms appeared. It was found that spawn could not be easily grown in the flasks unless the compost was well washed prior to sterilization. In contrast, unwashed compost was observed to be superior for obtaining mushroom fruit. Composted corn debris (leaves and stalks) worked almost as well as composted straw for fruiting P. mexicana in the clay pots. Psilocybe caerulescens was grown in a similar manner but would not produce fruit on composted straw. Composted corn debris served as a suitable medium, however, for fruiting Psilocybe caerulescens in greenhouse culture. Less abundant crops of Psilocybe caerulescens were obtained using a mixture of straw and corn debris composts. Psilocybe semperviva readily fruited on composted straw, but yielded more luxuriant flushes on the corn debris compost. Psilocybe mixaeensis produced mushrooms on various composted media, such as wheat straw, corn debris, and horse dung. Mexican strains of Psilocybe yungensis were fruited after five or more months of culture on a moss medium in glass flasks. Psilocybe zapotecorum, a species first fruited on a medium of moss, was grown both on straw and horse dung composts in glazed earthenware pots designed to retain water. The mycelial laden compost was cased with calcareous sand and then completely submerged under water. Magnificent Psilocybe zapotecorum mushrooms came up right through the water! This interesting phenomenon is in keeping with the "subaquatic" ecological nature of the species. Psilocybe cubensis was fruited on cased horse dung compost in earthenware pots. Some specimens attained a full twenty centimeters (almost eight inches) in pileus diameter. In the two decades between the research of Heim and Cailleux and the book of Pollock, few original discoveries were published. "Underground" booklets and pamphlets began to circulate, some describing the cultivation of psilocybian mushrooms. Notable among these was The Psychedelic Guide to Preparation of the Eucharist, a 1968 book that described cultivation of Psilocybe cubensis on agar, liquid culture, uncased rye grain, and compost, and P. mexicana on potato dextrose yeast (PDY) agar and liquid culture. This booklet also detailed the synthesis of psilocin and other psychedelics. An identical technique appeared at about the same time in another booklet, entitled The Turn On Book. In 1970, a little booklet entitled A Key to the American Psilocybin [sic] Mushroom was published by Leonard Enos. This contained more detailed information on tissue culture techniques, borrowed from scientific and popular literature. However, the cultivation techniques required too many additives to the agar and were overly complicated; hence, this pamphlet did little to stimulate the cultivation of psilocybian mushrooms. Another pamphlet, Field Guide to the Psilocybin [sic] Mushroom, appeared in 1972, and was sold through advertisements in counter-culture newspapers and by the thriving "head shop" businesses of the time. This pamphlet advised cultivating P. cubensis on compost in Falconer style, but starting from pieces of a fresh mushroom cap instead of collected mycelium. In 1972, University of Washington students in Seattle discovered a mushroom that began to fruit abundantly on bark mulch and lawns on the University campus. This event triggered the development of outdoor cultivation techniques for psilocybian mushrooms. According to Jonathan Ott, who wrote about this phenomenon in his books Hallucinogenic Plants of North America (1976) and Teonanácatl: Hallucinogenic Mushrooms of North America (1978), the mushrooms were usually found on the cedar bark mulch that the gardeners spread around landscaped areas of the campus. Intrepid student experimenters soon learned that these mushrooms were psychedelic, and their use as recreational drugs became very popular. An article in the student newspaper then warned that the mushrooms were dangerous (despite the fact that no illness resulting from the use of them was ever reported), and the gardeners were instructed to destroy any specimens and to put fungicides on the mulch. In 1974 they fruited abundantly in Olympia and Tumwater, Washington, and again on the campus of the University of Washington. An increasing number of students learned that the old French method of collecting mycelium and transplanting it to fresh substrate worked extremely well for mushrooms of this group, which were later identified as belonging to the "caramel caps." In fact, as mushroom pioneer Paul Stamets explains in his cultivators' bible, Growing Gourmet and Medicinal Mushrooms, "they are common in urban and suburban areas and are actually rare in natural settings. Ideal locations for collecting this mushroom are in the landscaped property of government facilities: courthouses, libraries, utility companies, and even police stations." The main difficulty of the "caramel cap" Psilocybes, such as P. azurescens, P. bohemica, and P. cyanescens, was that they only could be harvested one season per year in cool climates (and they were nearly impossible to fruit in more controlled conditions). So in his 1977 book, Pollock predominantly wrote about mushrooms that could be grown all year round, like Panaeolus cambodginiensis, P. cyanescens, P. subbalteatus, Psilocybe argentipes, P. baeocystis, P. caerulescens, P. coprophila, P. cubensis, P. fasciata, P. semilanceata, P. subaeruginascens, P. subaeruginosa, P. subcaerulipes, and P. zapotecorum. Most of the tested species yielded less biomass, were of lower potency, and fruited much later than P. cubensis. Mexican strains of P. yungensis, for instance, fruited after five or more months of culture on a moss medium in glass flasks. "Such a lag is entirely impractical for psilocybian mushroom fanciers," wrote Pollock in the introduction of Magic Mushroom Cultivation, "therefore, I will focus primarily on cultivation of species that can be grown easily and relatively rapidly." The rest of his book is almost exclusively dedicated to cultivation techniques for the potent Panaeolus cyanescens and the robust Psilocybe cubensis. For outdoor cultivation compost beds at least a foot high and several feet wide should be made. The beds are inoculated with spawn and kept moist by watering with a hose using a spray nozzle or running a lawn sprinkler system. It is necessary to water at least once a day in hot dry climates but not necessary to water at all in wet climates. Spawn from canning jars or other containers is broken up and placed about six inches under the surface of the compost bed. A couple of quarts of spawn is plenty for a six foot long bed but more can be used to reduce the chance of takeover by "weed" mushrooms. Outdoor compost cultivation works especially well for coprophilous mushrooms such as Psilocybe cubensis, Psilocybe coprophila, and many Panaeolus species. There are other magic mushrooms that can be grown this way, but none are as easily fruited as dung-inhabiting species. In fact, beds of fresh uncomposted horse manure may be used to grow coprobious mushrooms outdoors, especially Panaeolus species. It usually takes about a month to six weeks for mushrooms to appear on outdoor beds and flushes may continue for over two months, but the fruition is largely dependent on rain. Rain is what it takes for successful outdoor mushroom growing. Without adequate rain, crops can be induced to appear by frequent watering with sprinklers or a hose set in place with a sprinkler attachment. Compost beds inoculated with Panaeolus mycelia should not be cased and it is not necessary to case compost beds when growing Psilocybe cubensis (Pollock 1977). Fortunately, in 1960 the mycologist Dr. Leon R. Kneebone published a small scale adaptation of the current industrial method of growing Agaricus mushrooms for use with Psilocybe cubensis (Kneebone 1960). For the background of his discovery we have to return to the beginning of the 20th century, when Falconer's book was the only available one on the subject, the risk for Panaeolus subbalteatus "weed" mushrooms was still severe, and the hunt for a better method had just began. In 1903, after much experimentation, U.S. Department of Agriculture scientists produced the perfect pure-culture virgin Agaricus spawn. In 1915, pure culture spawn was produced on sterilized horse manure compost in bottles. The development of uncontaminated horse manure spawn, however, did not eliminate the problem of obtaining productive, reliable spawn. In 1930, Pennsylvania State College employed Dr. James W. Sinden to work on mushroom production problems. During one of his first series of experiments he found a medium on which the mycelium would grow more vigorously and that would provide a more uniform product: grain (specifically wheat), which was placed in flasks with a small amount of water and heat sterilized. On introduction of the mycelium, he found that it grew very vigorously and in a manner entirely different than anything previously seen. Thus grain spawn was born [U.S. Patent No. 1,869,517; see http://www.archpatent.com/patents/1869517] and has changed very little since. 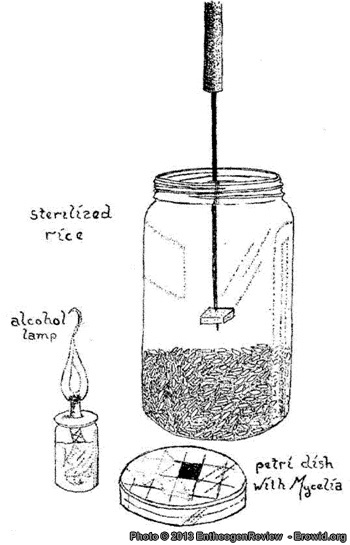 This is Dr. Stephen Pollock's rice cake technique of 1977 (drawing by Pollock), the predecessor of the PF TEK. A more low-tech process for producing Sinden spawn is currently not known. If McAlpine's agar medium is used to germinate the spores and grow mycelium, and peroxidated par-boiled brown rice is used as substrate, all steps can be performed without eyedropper/syringe/pipette and without a dry vermiculite contaminant barrier in an unsterile still-air environment. See Wayne's manuals at www.mycomasters.com if you want to know why only peroxidated par-boiled brown rice can be used. Unfortunately the mycelium needs a lot more time to colonize brown rice when it grows from an agar wedge compared to a liquid inoculation as in the PF TEK. But when it finally is colonized, CountZero's technique can be applied (both on the agar culture and the colonized Sinden spawn) to inoculate lots of contaminant barrier-topped PF Substrate jars by syringe or pipette. In my experience liquid inoculations without a contaminant barrier ("free pouring") in a nonsterile environment are too sensitive to contamination. Note also that the moist vermiculite casing is missing in this drawing; while it is not necessary, it really promotes fruiting if it is added. Kneebone's important discovery was that Psilocybe cubensis did not need compost, but could be fruited on Sinden's spawn (pure grain medium). Pollock followed Kneebone's path further and tested grains/seeds of crimped oats (Avena sativa), hemp (Cannabis sativa), coffee grounds (Coffea arabica), soy bean (Glycine max), rye grass (Lolium perenne), brown rice (Oryza sativa), rye (Secale cereale), milo (Sorghum vulgare), millet (Panicum miliaceum), Canary seed (Phalaris canariensis), wheat (Triticum aestivum) and corn (Zea mays). Pollock soon concentrated on cheap and commonly available brown rice grains. He found that brown rice medium was highly selective for P. cubensis (no other mushroom could be fruited on it). Indeed, the selective quality of brown rice protects newbie psilonauts against accidentally growing toxic mushrooms. But there are more reasons to think of brown rice as superb. In the 1980s, German mycologist Dr. Jochen Gartz, went so far as to file a patent (No. 88-09773, Akad. Wiss. DDR) on brown rice after his discovery that this medium supported the cultivation of P. cubensis of unprecedented potency--1% psilocybin/psilocin by dry weight (which almost equals Panaeolus cyanescens), the highest natural potency ever reported of this mushroom. For growers of today it is difficult to imagine how much work it must have been to test so many mushrooms on so many different substrates before a compost alternative was found that met all demands (especially when we keep in mind that cultivation techniques were in their infancy). Many experiments only resulted in huge outbreaks of green molds. Nevertheless Pollock came to a conclusion. Considering that Psilocybe cubensis was the psilocybian of choice, he pointed out brown rice as the most commonly available, most economical, and therefore most convenient substrate for home cultivators. Gartz' discovery that highly potent P. cubensis could be grown on brown rice was a huge bonus too. "Nevertheless," wrote Gartz, "it appears unlikely that cultivation of Psilocybe cubensis mushrooms by laypersons will significantly heighten the mushroom's popularity or widen its area of distribution anytime soon" (Gartz 1996). Gartz was right. The solution of the compost problem came with a double price tag. The first problem was that yields on pure grain substrates were unpredictable. An answer was not found until 1971, when mycologist James P. San Antonio tried Falconer's loam casing on Sinden's grain spawn for producing Agaricus brunnescens, with fabulous results. He showed that covering the mycelium (or vegetative state) of this mushroom with about half an inch of slightly alkaline soil could greatly increase the yield by causing it to "fruit" repeatedly in "flushes" appearing periodically. Basically, I developed the technology for growing cubensis on sterilized rye in mason jars. Actually, all I did was adapt the technology first developed by J.P. San Antonio. [...] I just adapted the method to cubensis and it worked. Your tax dollars at work! It was Terence who saw the entrepreneurial possibilities in the method and helped to scale-up the operation [...]. In Pharmacotheon (1993), Jonathan Ott noted that the mason jars (American one-quart home-canning jars) of grain substrate permeated by mycelia were sold for about $10.00 each. Dennis and Terence McKenna then worked together to write a book about the method, along with illustrations by Kathleen Harrison and photographs by Jeremy Bigwood. That book, Psilocybin: Magic Mushroom Grower's Guide--A Handbook for Psilocybin Enthusiasts (1976), became the single best-selling counter-cultural drug book ever published. The casing mixture the authors recommended was made with 3.5 liters fine vermiculite, 4.0 liters washed fine sand, 2.5 liters peat moss and 2.0 liters finely crushed oyster shells. Just in time before the publication of his own book, Pollock found a shortcut to the mixture by using potting soil that comes pre-mixed with plenty of vermiculite, peat moss, and sand. In 1983 the substrate was further simplified when mycologist Edmond Badham found that damp brown rice with a casing layer of only moist vermiculite was sufficient--the results of his experiments were published in the journal Mycologia and in his thesis, Cultural Studies on the Mushroom Psilocybe cubensis (Badham 1982, 1983). The second problem with using grain spawn as fruiting substrate--especially by laypersons--is that it is extremely contamination sensitive. Without sophisticated techniques most attempts are thwarted by the presence of bacteria and molds. For too many growers this meant that they had to invest in laboratory equipment, an investment that they could only recover through large-scale commercial production. [With the publication of their book they] hoped that users cultivating these mushrooms in their homes would be independent of the illicit market, which at the time was producing and selling many spurious products. Further, they hoped that this technique would become a permanent part of the subculture, immune from surveillance and anti-drug crusades. To a certain extent, these ends have been met. However, the authors did not realize that there would be as many large growers as have emerged. Their technique was still so complicated that only a small percentage of users have even tried it. A large pressure-cooker is needed, and many couldn't get the hang of the spore-growing and sterilization requirements for inoculation of the rye jars. The reason that such equipment was necessary was that the McKennas primarily reproduced the existing 1932 patent of Sinden. 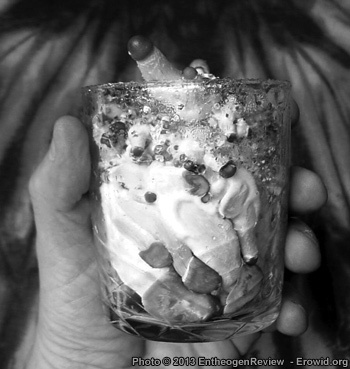 Mushroom spores were first germinated on agar, and the resulting mycelium was transferred to grain jars. 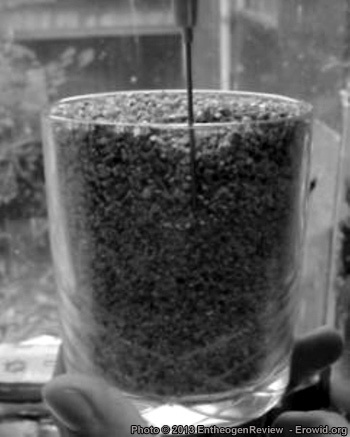 To speed up the colonization of the substrate the grains had to be mixed every few days by shaking the jars. Because brown rice usually is too sticky to be shaken, the authors recommended the less productive (and in urban environments often difficult to obtain) rye grains. Finally the colonized grains had to be covered with a casing mixture. In the laboratory all these steps are performed in a sterile work-space. The average basement shaman lacks such an environment, and unfortunately all the McKennas offered as a solution was a poorly designed glovebox. Sterilize a bit of water, take up about 10 cc in a presterilized syringe and inject it onto the surface of an agar mycelial culture (slant test-tube cultures are ideal for this). Reseal the culture and swirl the water around vigorously until fragments of mycelium become visible suspended in the water. Then take up the water-mycelial suspension in the syringe, and inject 1 or 2 cc's into each jar. Mycelial growth should become visible from one or more points in the jar by 3-4 days after inoculation. [The spores] can be scraped into 10 ml of sterilized water, then dilute to 100 ml by adding sterile water, take up 2-3 ml of diluted spore solution into a syringe, and point-inoculate the petri plate by placing a drop of the solution at two or three separate points on the agar. Strangely enough, they never put their techniques together, and these ideas are dropped entirely from later editions of their manual. The credit for combining these techniques goes to the author of a September 1991 publication titled the Psylocybe Fanaticus Technique (or PF TEK). This manual described, for the first time, the method of injecting a spore solution directly onto a fruiting substrate of brown rice and vermiculite. The touch of genius in the technique was in the use of a vermiculite casing layer as a contamination barrier during the inoculation and substrate colonization. The glovebox was no longer necessary. A syringe needle could easily penetrate the layer and be withdrawn without exposing sterilized substrate to unsterile air. Incoming airborne contaminants could not germinate in the casing nor reach the moist substrate. At the same time, the mycelium below the layer could thrive because filtered air exchange remained possible. By choosing half-pint rather than quart jars, the frequent shaking (and thus the choice for non-sticky rye grains) became unnecessary. And instead of shouldered Mason jars the author recommended straight or slightly tapered Ball or Kerr canning jars, which could be removed from the substrate. This simple idea enabled the harvesting of mushrooms that grew at the sides of the substrate, without needing to break the jar. Other PF innovations were the "Double Chamber Terrarium"--a growing environment designed to create a foggy atmosphere that mushrooms like best to grow in, but which at the same time protected substrate cakes against puddles of sprayed water, and his cold desiccation drying method--mushrooms were first pre-dried in a sieve and then put in an open Ziploc™ baggie that was placed in a glass jar with a one inch layer of calcium chloride on the bottom. The jar was closed and put in a refrigerator for a week. The calcium chloride was dried by baking the jar, without lid, in an oven. The dry vermiculite contaminant barrier in action. It is an original PF invention: a needle can penetrate it without exposing the substrate to unsterile air. It allows respiration of the mycelium, doubles up as casing layer (moisten the layer when the substrate is colonized) and is re-usable. In my opinion, no filter disk can match it in simplicity and effectiveness. From its first publication, the PF TEK was an instant success. As the world wide web became increasingly accessible, many PF TEK-based cultivation techniques were published on-line (see www.erowid.org/plants/mushrooms/mushrooms_cultivation.shtml). Together, these techniques have been downloaded over a million times, which may make the PF TEK the best distributed cultivation technique for any organism of all time. In 1996 the popularization of the PF TEK accelerated tremendously, when the Internet newsgroup alt.nature.mushrooms was founded. The newsgroup soon turned into a Psylocybe Fanaticus fan club. By 1998 most of the Psilocybe cubensis growers on the newsgroup had moved to the newly created alt.drugs.mushrooms. At the same time, law enforcement agencies in Minnesota were beginning to see an increased number of mushroom growing operations. Since it is illegal to possess any material, compound, mixture or preparation that contains any quantity of psilocybin and/or psilocin--while mushrooms themselves are not specifically scheduled--it became important for law enforcement personnel and forensic chemists to know in what stage of development the psychoactive drugs can be identified. Since many articles are published about the production of psilocybin by mycelial cultures on agar and liquid media, the FBI forensic sciences laboratory first tested the spore-syringes and later the mycelial mat on the PF Substrate for controlled substances (see www.fanaticus.com/forensic.htm). Psilocybin and psilocin were not found, and repeated tests confirmed the lack thereof. It was determined that the mycelium "knot" stage of the mushroom was the earliest point when the drugs could be detected. In other words: when PF Substrate is used, the colonized cakes are not illegal before the pinning stage of the mushrooms. (Be aware that such cakes can be considered illegal when they are used as "precursors" to produce a psilocybin/psilocin-containing crop, which certainly can be argued if the cakes are seized along with harvested mushrooms!) Why the non-pinning PF Substrate doesn't produce the drugs, and agar or liquid cultures do produce them, is still an unanswered question. But the advantage for basement shamans is clear. Hippie's observation was correct except for two things: exposing the jars to daylight through "the entire colonization process" is not necessary, nor are the Ball/Kerr canning jars. As early as 1980, the aforementioned mycologist Edmond R. Badham had published an article about the effect of light upon mushroom formation of Psilocybe cubensis (Badham 1980). He found that a lighting period as short as 0.0025 second was sufficient to initiate pinning, provided that the light was of a wavelength of max 460 nm (blue daylight) and that the substrate was fully colonized. Combined with Hippie's observations, this meant that "backpack cultivation"--as well as sending colonizing cakes through the mail--was possible. Combined with the FBI finding, this meant that colonizing mushroom cakes would be legal as long as the cakes were kept in total darkness. Both ideas were successfully tested during the summer of 2001. Also, the Ball or Kerr canning jars that are recommended in the PF TEK may be replaced by a large shot-glass, as is shown below. Such a glass does not break during the sterilization process, provided that it is not directly placed on the bottom of the pan. The metal screw-lid of canning jars can safely be replaced by tinfoil. And if the dry vermiculite top layer is at least two fingers deep, it is not necessary to inoculate the substrate through four pinholes--the tinfoil covering can simply be lifted and replaced after inoculation. The needle of the syringe does not need to be flame-sterilized for this step--it is sufficient to wipe it clean with a tissue that was soaked in 140-200 proof alcohol (which may be denatured). Another recent improvement is the method to supply water to the mycelium. In the basic PF TEK the cakes are protected against direct watering by being placed in an environment where a foggy atmosphere can be replicated. Hippie found that it is also possible to rehydrate dried-out cakes by keeping them for 12-24 hours under water, a technique that largely parallels the rehydration method for Lentinula edodes as described in Growing Gourmet and Medicinal Mushrooms by Paul Stamets. Yet another--and often easier--method is to add water to the dry top layer of the cake (Psylocybe Fanaticus recommends two such layers: one on top and one at the bottom of the cake). To ensure that too much water isn't added, the glasses should be weighed immediately after sterilization. After each harvest, water is added to the top layer, but just enough that the substrate glass weighs the same weight as it did in the beginning. Also worth mentioning is a simple method to keep the glasses cool after pinning--important to do because the psilocybin content is retained best at temperatures around 20° C. Even in the hottest summers the substrate glass can be kept cool when it is put in a sock, dipped in cold water, and hung somewhere. The jar is then cooled by evaporation of the water so it is important to keep the sock wet. Further cooling of the cakes to 4° C also is useful--colonized but pre-pinning cakes can be stalled from fruiting for up to 3 months in this manner, only to then fruit on demand when they are returned to room-temperature. The inoculation procedure. 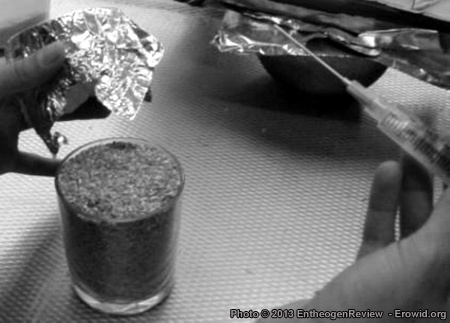 When the shot-glass has cooled down and the needle is wiped clean with alcohol, just lift the tinfoil and inject. Place the foil back on top and write the mushroom genotype, the date, and the total weight of the jar on the foil. All the recent good news however can not mask the fact that the PF TEK has one weak point: the production of uncontaminated inoculant still requires a skilled cultivator and a sterile working place. The method as described at www.fanaticus.com/syringe.htm is as simple as possible, but still not suited for backpack cultivators. For producing viable spore-water, this need for a sterile environment may be forever true. But for mycelium-water, new techniques recently became available. And as usual, the "new" techniques came with an interesting history, which in this case goes back almost half a century. In the 1940s, the orchid grower K.L. McAlpine was looking for a better method to clean orchid seeds prior to germinating them on a sterile agar medium. This was necessary because the agar was easily contaminated by the bacteria and molds typically found on dirty seeds. Seeds were routinely cleaned with sodium hypochlorite, but in many cases a bit of this disinfectant ended up in the agar medium, which effectively killed the plant over time. McAlpine sat down and pondered what sterilizing agent (as well as its possible products of decomposition) might kill the undesired fungi, without affecting the orchid seeds or the reaction of the medium. Furthermore, its effective concentration should not be critical. "Such a substance," wrote McAlpine later, "could be added directly to the culture medium and the seeds then sown with complete disregard to sterility." The agar does not even need to be steam-sterilized for this but just heated to dissolve in its components. While still warm, the agar medium is poured into small jars containing the peroxide dissolved in a minimum amount of water. The jars used for comparative purposes were one-ounce, clear-glass, screwcap ointment jars. So soon as the agar has set, dry orchid seeds are evenly distributed over the surface. The lid is then screwed home and the jar placed in a suitable location for the seeds to develop. Hydrogen peroxide does not change the reaction of the medium: it is highly fungo-static and does not decompose into toxic substances. This method probably more closely than any other before described, duplicates the natural process. McAlpine was quite right. Hydrogen peroxide (water with one additional oxygen atom), is a chemical that is extremely effective in destroying single-celled organisms: the extra oxygen is very reactive and burns holes in cell membranes. Since hydrogen peroxide is made from (and decomposes in) water and oxygen it is easily formed in nature. It is the among the first chemicals that life forms need to defend themselves against. Since single-celled organisms (bacteria, yeasts, spores) have but one cell they can lose, they are the primary victims of this chemical, while each and every multi-cellular organism (as well as a colony of single-celled organisms) has peroxidase enzymes to defend itself. Many such organisms even produce hydrogen peroxide as an antibacterial weapon. Bees for instance, produce hydrogen peroxide to keep collected nectar and honey (a perfect medium for most molds) sterile. Unfortunately, McAlpine's pioneering work was not followed up, perhaps because hydrogen peroxide was generally believed to be an unstable, even explosive, compound. Indeed, it was such a compound in McAlpine's time. But since 1950, new methods for keeping hydrogen peroxide stable were implemented (a tiny bit of phosphoric acid did the trick). Also, 3% peroxide, which is much safer to work with, became widely available. Still, it would take almost four decades before the botanist Richard Snow rediscovered McAlpine's method and published commentary about it in the American Orchid Society Bulletin of February 1985. Snow tested McAlpine's findings by deliberately inoculating a culture medium with a mold, and found that a concentration of 0.1% hydrogen peroxide killed the mold, while concentrations between 0.01-0.05% didn't harm its growth. What followed was a fairly complicated and non-linear process of learning about growing various mushrooms, trying different concentrations, learning about different culture media and how they interacted with the mushrooms and the peroxide, trying various degrees and techniques of pasteurization and sterilization, going back over earlier ground with better pH measurements, experimenting with supplements, tracking down sources of contamination, tightening my procedures, and on and on, until I developed some fairly reliable guidelines for what I was doing. It all took far longer than I ever would have guessed. But the upshot of it was that, yes, hydrogen peroxide can be used to help keep mushroom culture media free of contaminants without killing the mushroom cultures themselves. Eventually Wayne found a whole collection of specialized cultivation techniques for mushrooms, all without the need for a pressure canner or sterile working environment. Most of the techniques are meant for indoor cultivation of non-psilocybian mushrooms on bulk substrates of sawdust and straw. They are not very useful for Psilocybe cubensis cultivation in backpacks and shot-glasses. Nevertheless, I cannot over-recommend Wayne's writings on this topic (available via www.mycomasters.com) to anyone who wants to use peroxide techniques in his or her cultivation routine, as peroxide is only useful in specific occasions. If used in the wrong way peroxide will not protect against contamination--or even worse, work too well and kill everything, including the desired mushroom mycelium. "Here's what I have done: I clean my blender out well with soap and hot water, rinse with tap water, then rinse the blender and a lid with boiling water (get a pair of heavy rubber gloves for doing this kind of thing and you'll have far fewer scalds). Next I fill the blender most of the way with boiling water and let it sit for 10 minutes or so. Then I empty out the water and cool the blender with the lid in place. Now the blender is ready for use. With my jars of sterilized grain at the ready (previously treated with peroxide), I add enough sterile water to the blender to cover the blades, and one or two milliliters of 3% hydrogen peroxide as well. Then I cut a donut of mycelium out of an agar culture with a flamed scalpel (leaving behind the outer edge and the center of the culture) and carefully drop this donut into the blender. With two or three one-second bursts of the blender, the agar is chopped into modest-sized chunks. At this point, the peroxide in the blender begins to bubble off oxygen rapidly because of the enzymes released by cell breakage, so I immediately free-pour the resulting slurry into my waiting spawn jars, trying to add about 15 to 20 mls per jar. Finally I seal the jars and shake them to distribute the slurry. Growth can be observed from the larger chunks of agar in two or three days." [F]or two reasons. The first is that any method of inoculating a liquid culture is likely to require blenderizing the inoculum (or in some other way breaking up the mycelium), which releases significant quantities of peroxide-decomposing enzymes into the medium upon inoculation. The second reason is that, even assuming the first problem could be overcome, I would still expect the peroxide concentration to decline rapidly in a liquid culture as the intact fungal material with its internal peroxide-decomposing enzymes circulates throughout the liquid. The decline in peroxide could be compensated for by regular addition of fresh peroxide, but this might require a method of measuring peroxide concentration in very dilute solutions. You just need to cut a piece of mycelium from a cake that [you] just birthed and quickly put it in a jar full of distilled water and some pieces of glass which you should have sterilized and let it cool down. Seal the jar again and [shake it like] hell so the mycelium will break to pieces (because of the glass). Add 1 cc of 3% hydrogen peroxide and let it sit for a day, shaking [occasionally]. Then draw the water into syringes. A small piece of mycelium can give you many strong syringes. But you'll have to use them within a week or so. If used immediately the germination is massive. Strangely enough, Wayne and CountZero are both right: peroxidated slurries can only be used in combination with a contaminant barrier, such as the dry vermiculite top layer in the PF TEK. Peroxidated slurries cannot be poured without an extreme risk for contamination, but only transported by pipette or syringe. And mycelium-water does not have a long shelf-life compared to spore-water. It is these problems that this article will now address, by outlining a new simple add-on technique to the PF TEK--an original method that enables backpack cultivators to "copy" a just-colonized substrate cake. In short, I recommend that one follow Count-Zero's process, but without glass, presterilized water, or an extra jar. It only works with a just-colonized cake that has not been out of the glass yet, when performed on a clean tabletop and in a still air environment (no wind). 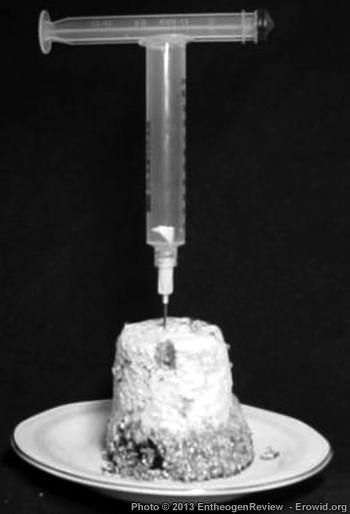 A piece of substrate cake inside the syringe barrel with the plunger balanced on top, ready to be made into a mycelium slurry. First, get a glass with a substrate cake--preferably one that is just recently colonized. Place it in a wind-free environment on a clean table top (if you work in the kitchen, close the doors and windows). Bring a small pan of water to a boil. Fill an empty syringe with boiling water. Place a sharp knife with the blade in the pan of boiling water and turn off the heat. Place the substrate glass upside down on a piece of paper on the table top. After a minute or so, empty the syringe back into the pan. Then take the plunger out of the syringe barrel, put the plunger in the hot water, remove the glass from the substrate cake and stick the empty syringe, needle down, in the top of the cake. Get the knife out of the hot water, cut a small wedge out of the cake and place it in the syringe barrel. Remove the syringe barrel from the cake and re-insert the plunger. Point the needle upwards and eject the air from the syringe. Put the glass back on the substrate cake and store this "mother cake" in the fridge. If everything is right you will now have a clean piece of cake in a clean empty syringe. Now draw 1 cc of cold, clean (tap or bottled) water into the syringe, 0.2 cc of 3% hydrogen peroxide (preferably from a fresh unopened bottle) and the cleanest air you have available (you may draw in air from just above an alcohol lamp's flame to ensure that it is clean). Shake the syringe vigorously, eject the air from the syringe (needle pointing upwards) and fill the syringe with clean cold water. Allow the peroxide to work for five minutes and then inoculate a new glass of PF Substrate with it. There are two fairly sketchy alternatives for keeping a "mother cake" in the fridge. One is to make peroxidated mycelium-water with CountZero's technique and store that. The other is to not use a mother cake but copy each cake at the moment it is colonized (making copies from copies, from copies, etc.). While both of these alternatives may look like shortcuts, they are dead-ends in reality. The reason for not storing mycelium-water was mentioned earlier by Wayne and CountZero. If there is plenty of peroxide in the water it will overpower the peroxidase enzymes and kill the mycelium over time. If, on the other hand, the peroxidase enzymes manage to destroy the peroxide, the mycelium-water is prone to contamination. But even if no contamination occurs, Psilocybe cubensis mycelium-water doesn't have a long shelf-life compared to spore-water. It is much better to store solid spawn. Making copies from copies is not a good idea either, because no living organism is designed for an unlimited amount of cell divisions. Mycelium is no exception. Eventually it will go senescent and lose the ability to make mushrooms. The idea to keep a mother cake for cloning is meant to delay that moment as long as possible by maintaining a young cell line. With these new techniques it is finally possible to grow mushrooms from spores or mycelium without the need of a sterile working space and without the need of buying a spore-syringe. However, these methods are probably not a real substitute for the spore-syringe. This is because the germination of mushroom spores on a medium other than the fruiting substrate (and the production of a mycelium slurry which can be injected in the latter) easily requires one to three extra weeks compared to a simple inoculation by spore-syringe. More important is that the new techniques for making mycelium slurries are still not as "idiot proof" (= contamination proof) as the spore-syringe method, provided that the spore-syringe is obtained from a vendor that guarantees the viability of it. As well, considering that several vendors now offer spore-syringes for $10.00 or less, there is the question of whether or not the techniques required to collect spores, germinate them in test tubes, and make peroxidated mycelium-water are really worth pursuing, since these steps will take more than an hour to complete, and for many people an hour of their time is worth more than $10.00. Especially if a spore-syringe is obtained from one of the vendors that guarantee viability, it will be difficult to find a more cost effective method. At the time I wrote this article, Psylocybe Fanaticus offered the best guarantee of viability, stating: "The syringes are absolutely guaranteed to be clean, viable and authentic, or your money refunded or syringes replaced until satisfaction is achieved." PF TEK-like methods equally catch on in introductory textbooks on microbiology and biotechnology (see "Carpogenesis and Basidiosporogenesis" by Suki C. Croan). It is now established that Psilocybe cubensis is the primary candidate for easy biosynthesis of psilocin and psilocybin. 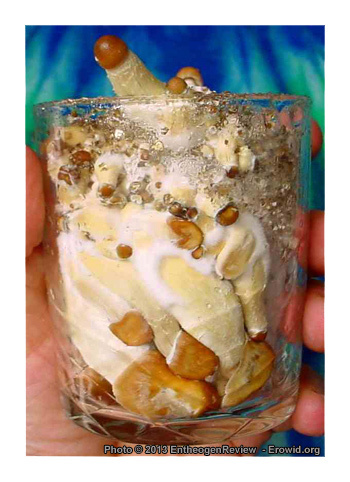 The shot-glass version of the PF TEK is the easiest method for professional and beginning cultivators and the "Matías Romero" and "Golden Teacher" varieties of P. cubensis are the best performing mushrooms on brown rice powder and vermiculite (at least for the moment). But this does not mean that all innovation has ceased on the psilocybian frontier--at least two new directions are being currently surveyed. The first one is the search for other, preferably more potent, mushroom species that can be fruited on grain-based media. In the 1980s, Gartz reported success with P. bohemica, P. natalensis and Gymnopilus purpuratus. At the web-based forum www.shroomery.org are a couple of beautiful pictures from another German researcher named Electrolurch, who fruited a new strain of the majestic P. zapotecorum that he had collected in México. Every month, more "new" cultivable Psilocybe species are reported about on this and similar forums, such as www.theforestfloor.org, www.mycotopia.net, and alt.drugs.mushrooms. The other interesting direction is the formulation of a growth medium that enables psilocybian fungi to biosynthesize tryptamines that are usually created artificially in a laboratory, like 4-hydroxy-DET, 4-hydroxy-DPT, and their phosphoryloxy counterparts. Other interesting psychoactive compounds that could possibly be biosynthesized this way are ergine. 4-hydroxy-aMT, baeocystine, norbaeocystine, non-phosphoryl esters of methylated alkyl tryptamines, and 5-substituted alkyl tryptamines. For these experiments the sclerotia-forming grassland psilocybians Conocybe cyanopus, Inocybe aeruginascens, Psilocybe mexicana, P. semilanceata and P. tampanensis as well as some non-sclerotia-formers like P. azurescens, Panaeolus cyanescens, P. tropicalis, and Pluteus salicinus might be very useful. Yet none of these species currently has a simple, established, well-performing, non-sterile in vitro method of cultivation. "Designer biosynthesis" via mushrooms is a largely uncharted territory. In short there is still plenty to discover for the basement shaman who has just started his or her hobby. Much of the equipment of the 20th century is no longer needed, so not being skilled in laboratory techniques is no longer an excuse. The only necessary ingredient for a breakthrough is a curious mind, as the days of easy home-cultivation and independence from "street dealers" have definitely arrived. Badham, E.R. 1980. "The Effect of Light upon Basidiocarp Initiation in Psilocybe cubensis," Mycologia 72: 136-142. Badham, E.R. 1982. "Tropisms in the mushroom Psilocybe cubensis," Mycologia 74: 275-279. Badham, E.R. 1983. Cultural Studies on the Mushroom Psilocybe cubensis, Ph.D. Dissertation. University Microfilms, Ann Arbor, Michigan. Gartz, J. 1993. Narrenschwamme-Psychotrope Pilze in Europa. Gartz, J. 1996. Magic Mushrooms Around the World--A Scientific Journey Across Cultures and Time--The Case for Challenging Research and Value Systems. LIS Publications. Ott, J. 1976. Hallucinogenic Plants of North America. Wingbow Press. Ott, J. 1978. Teonanácatl: Hallucinogenic Mushrooms of North America. Madrona Publishers, Inc.
Kneebone, L.R. l960. 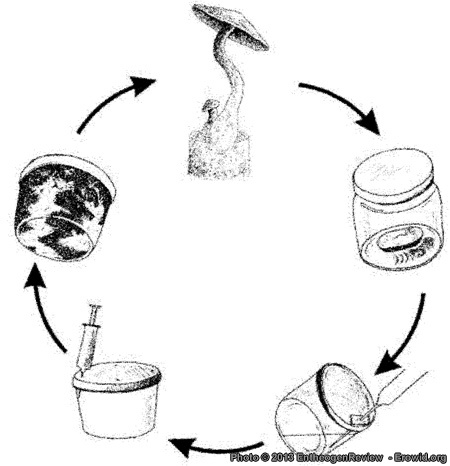 "Methods for the production of certain hallucinogenic agarics," Developments in Industrial Microbiology 1: 109. Ott, J. 1996. Pharmacotheon: Entheogenic Drugs, their Plant Sources and History, second edition, densified. Natural Products Co.
Pollock, S.H. 1977. Magic Mushroom Cultivation. Herbal Medicine Research Foundation. Stafford, P. 1993. Psychedelics Encyclopedia. Ronin Publishing, 3rd Edition. Stijve, T. 1992. "Psilocin, Psilocybin, Serotonin, and Urea in Panaeolus cyanescens from Various Origin," Persoonia 15(1): 117-121.
v1.1 - Feb 21, 2013 - Published on Erowid. Fixed minor typos, dead links replaced with current ones, missing references added. v1.0 - Winter 2001 - Published in The Entheogen Review.